PASADENA, Md. 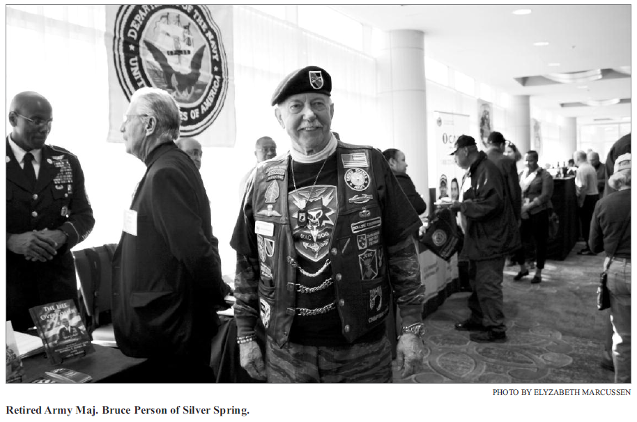 (April 9, 2019)—There were many milestones mentioned at the Welcome Home Vietnam Veterans Day Celebration held March 29 at the Hilton Baltimore BWI Hotel in Linthicum. It honors the proclamation by Gov. Larry Hogan that 2019 is the Year of the Veteran for Maryland. It was the fifth year for the event honoring the state’s annual commemoration, which was the first bill the newly elected Hogan would sign into law in 2015. But most importantly for the guests of honor, it was 46 years from the date the last United States troops left South Vietnam, and these Vietnam veterans were there to be welcomed home. Headquartered in Pasadena, with offices in Largo, Maryland, the nonprofit is a Commemorative Partner in the United States of America Vietnam War Commemoration as well as a 5-Star Partner in the We Honor Veterans program, a national hospice initiative honoring the men and women from all branches of the military who have served our country. For 40 years, Hospice of the Chesapeake has been caring for life throughout the journey with illness and loss. Visit www.hospicechesapeake.org. BALTIMORE (April 4, 2019)—This April marks National Safe Digging Month and BGE reminds all customers and contractors to call 811 a few days before digging to learn the approximate location of underground utilities. A national survey conducted in March by the Common Ground Alliance, the national association dedicated to protecting underground utility lines, people who dig near them, and their communities, revealed that 42 percent of homeowners who plan to dig this year for DIY projects don’t plan on calling 811 and will put themselves and their communities at risk. Homeowners and businessowners taking the step to call before they dig have helped reduce incidents of damage to BGE’s energy system by nearly 50 percent during the past five years. This improvement is attributed to increased awareness as a result of ongoing outreach and education to raise awareness about underground facilities. Digging without knowing the approximate location of underground utilities can result in serious injuries, service disruptions and costly repairs when gas, electric, communications, water, and sewer lines are damaged. Every digging project, no matter how large or small, warrants a call to 811. Landscaping, planting trees and shrubs, installing a fence or mailbox, and building a deck, pond or patio, are all examples of digging projects where a call to 811 should be one of the first steps. More than 60 percent of BGE’s electric lines, approximately 17,000 circuit miles, are located underground and BGE manages more than 7,000 miles of buried natural gas lines in its region, many of which may cross through residential properties. Properly locating these lines is essential to safely completing a digging job. • Visit call811.com for more information. When calling 811 at least three business days prior to digging, customers and contractors are connected to Maryland One Call that will take the caller’s information and communicate it to local utility companies. Professional locators will then visit the dig site to mark the approximate location of underground utility lines with spray paint, flags or both. Once a site has been accurately marked, it is safe to begin digging around the marked areas. To promote safety around electric infrastructure in the communities it serves, BGE also reminds residents and businesses that customer-owned structures are not permitted within BGE’s easements or near overhead equipment. Customers must contact their local municipality to obtain the necessary permits prior to any construction near company-owned transmission or distribution lines. BGE joins the Exelon family of companies, the other 1,700 Common Ground Alliance members, the U.S. Department of Transportation, and governors across the country in marking April as National Safe Digging Month to bring extra attention to the issue of underground utility line safety and reduce the risk of unnecessary infrastructure damage. For information on digging safely, including how to get lines marked and what to do after lines are marked visit www.bge.com/811, or contact the BGE Damage Prevention team at 410.470.6698 to arrange for free damage prevention training.